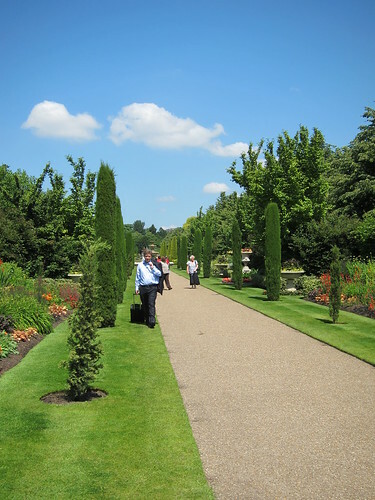 Last year, I was lucky enough to attend the Taste of London food festival in Regents Park by rather sinister and shady means. My sisters friend had won two VIP tickets after entering a competition run by a well know purveyor of orange juice. She couldn't go so my sister and I were the lucky owners of two VIP passes and £50 worth of crowns. During a day where I watched a very hung-over Hugh Fearnley Whittingstall screw up almost everything he attempted, met Jun Tanaka and ate tonnes of great food, I vowed I would go back. 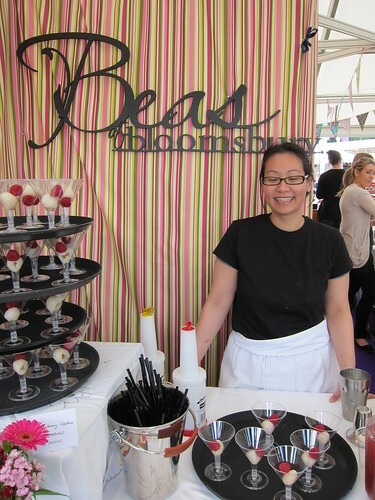 Roll on 2010 and this time, not only was I a punter (having been lucky enough to be invited back, this time bestowed with a press pass) but I also offered to put in a shift at Beas of Bloomsbury, purveyor of cupcakes and stonking Lychee martinis. Here are a few highlights of a fab few days. I was hanging around with the delectable MiMi for much of the day and as she is "bezzer" mates with Tristan Welch, we headed on over to say hi and try out what turned out to be one of the biggest sellers of the festival, spit roast old spot suckling pig and black summer truffles, served like a pork roll. Inviting us to come round the back and check out the hive of activity, we surveyed the rotating pig and headed back out the front to sample the produce. 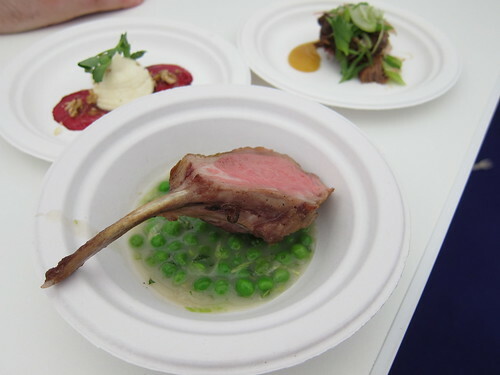 I can say with no favouritism what so ever that this was my favourite dish of the festival. So good, I had to come back the next day when I was working and have another. 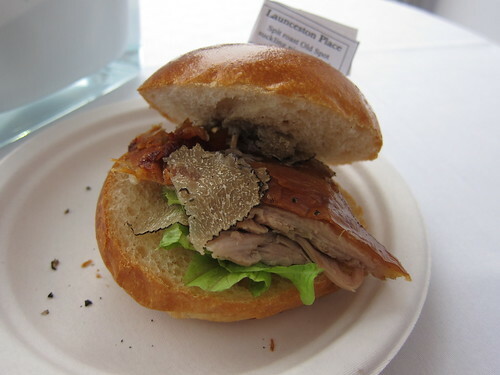 Crisp skin, succulent pork and earthy truffles and truffle mayonnaise. Heavenly. 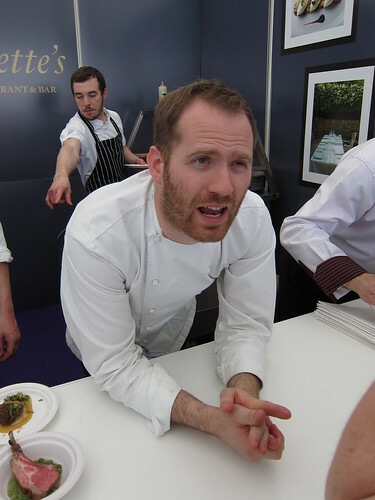 I am a big fan of the Great British Menu (regular readers probably know this already), and it was through watching this programme devotedly every day for weeks that I came across Bryn Williams. When I had heard that he had taken over the kitchen at Odette's, I vowed that I would go and sample some of his food. As with so many other restaurants, I haven't made it that far yet but jumped at the chance to sample some of his food at the festival. Whilst chatting to the laid back and affable Bryn, we sampled some excellent lamb and I tip off my hat to his version of beetroot and goats cheese. The addition of Regents Park honey was excellent and the subtle sweet honey really brought out the flavour of the dish. 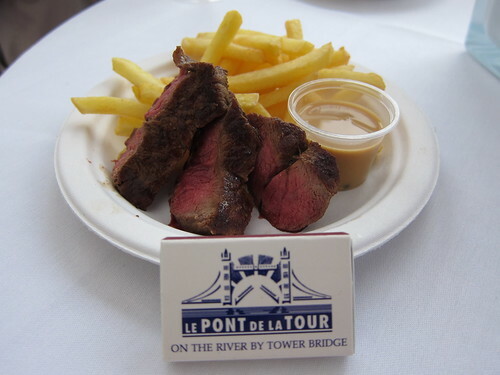 I spied a few people walking around with some very appetising looking beef and after a few enquiries and a break of will, I wandered over to Le Pont de la Tour to sample their steak au poivre and frites. With a deep char and a beautifully pink and tender centre, this was perfectly cooked. How they can replicate this for all the punters that they would receive throughout the day, I do not know. Excellent, grease free and crunchy frites, the overall dish was only slightly let down by a watery peppercorn sauce. When Bea put the call out for help on her stall, I thought I would throw my hat into the ring and help out. After all, how hard could it be, right? Oh, how wrong I was. My temperamental feet wilted under the pressure as I tried to knock up as many lychee and raspberry martinis as I possibly could. At the other end of the operation, the team worked tirelessly, selling cupcakes as quickly as they could. A very tiring day but a great experience. And those martinis were bloody good and all. So those were my highlights. 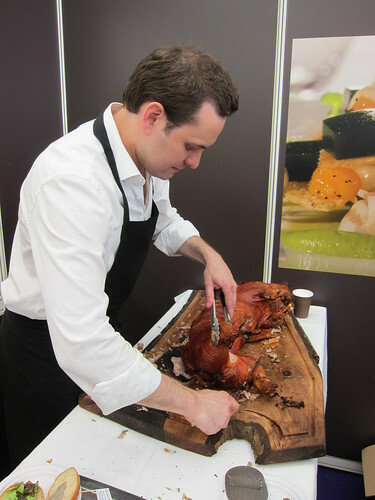 Obviously a tonne of other things went on too, and I managed to miss a few things I really regret (like Adam Byatt of Trinity's pigs trotters! ), and if you are that way inclined, I have some more photos up on my flickr site. The only real downside for me is that it can become quite an expensive day. I was lucky enough to be comped entry, but even then, most dishes are between £4 and £5, and sampling them becomes quite addictive. Roll on Taste 2011! When I went to Taste last year I thought although pricey it was worth it. 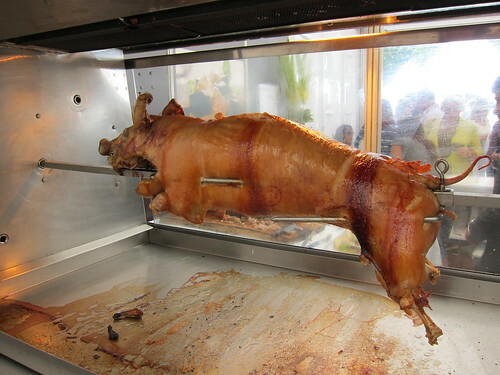 I think it is much better than other cheaper festivals like the Real Food Festival. Shame the weather didn't really come to the party this year. @GC - I think I preferred the line up of restaurants last year but the food was still excellent and it only comes around but once a year.